Here is a great text received a few weeks ago and that I thought you might enjoy. I will be on vacations until June 30th. The blog will be updated again on July 1st. 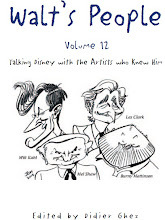 Issue 12 of the magazine Tales from the Laughing Place has just been released. I will be in Italy on Monday, Tuesday and Wednesday next week, so no update until next Thursday. 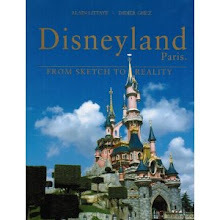 Here is a fascinating document sent to me by Philippe Videcoq as part of a much larger "memo" about Future Fantasias. Some of the ideas considered made it in Fantasia 2000. I have reposted everything as the pages I posted last Wednesday were unreadable. 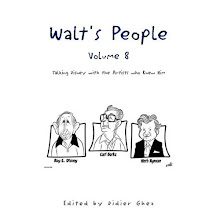 Walt's People - Volume 6 is now available on Amazon! If you have web sites or blogs, please spread the word. 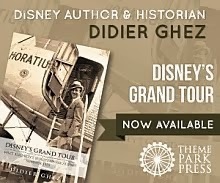 I was already excited about Charles Solomon's upcoming book Disney Lost and Found: Exploring the Hidden Artwork from Never-Produced Animation, but having received the cover image from Disney Editions yesterday, I am even more eager to get it... if only to find out where the image on the left comes from. Speaking of projects that were not completed: I will be travelling a lot within the next few weeks but I hope to find time to soon post an exceptional document about the Fantasias-that-never-were sent to me recently by Philippe Videcoq. Check this link for an excellent article that I just received from Jim Korkis. No zeros, all heroes—it’s the boys’ turn to shine! From the Prince who is Charming, to the Prince who began as a “diamond in the rough,” to the Lord of the Jungle, and to the many princes whose kiss led to a happily ever after, the Disney princes are often neglected in favor of their female counterparts. 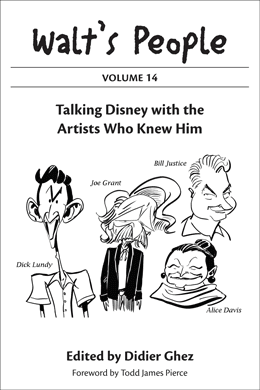 Disney's Neglected Prince is a hard cover “Art of” book that focuses on the guys, whether they rule from a castle, a forest, or a mountaintop, or just marry well. The roster includes royal favorites such as Princes Phillip, Eric, and the Beast; royalty from other realms including Hercules, John Smith and Li Shang; and the latest to ascend to the throne—Prince Edward from the upcoming Disney feature Enchanted and the Prince from The Princess and the Frog. 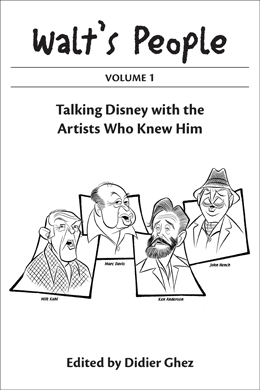 Rare and rarely seen visual development art from The Walt Disney Feature Animation Studio will give Disney fans an opportunity to enjoy these hand-drawn hunks in a whole new way. 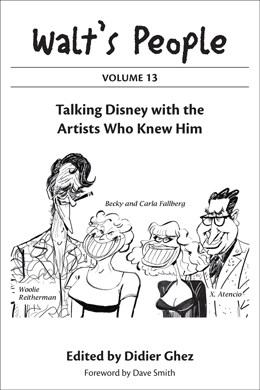 Disney's Neglected Prince is 9 x 11 in size, 128 pages, available in April 2009. She began as a flash of light in the mind of playwright J.M. Barrie, with a voice the sound of tinkling bells. And with a sprinkle of her pixie-dust, flight is possible! 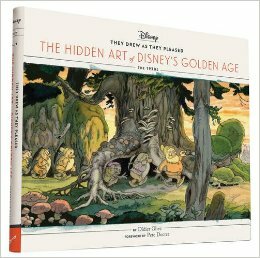 Yet, as magical as this little fairy is, she presented one of the more defining challenges to Disney’s remarkable animators. Said Walt, “We could make the little sprite glow like a firefly as she darts through space and have her speak with the sound of bell.” During her development for the film and then beyond, she has transformed from a tiny fairy ballet dancer – florally bedecked and aloof as a cherubim – to a high-tempered and ultra-feminine little vixen. Over the past fifty years, Tinker Bell has evolved into a beloved icon embraced by millions of fans for her coy flirtations, her pixie antics, and her potent doses of Disney magic, whether it’s on screen, in books, or setting off the fireworks in the Disney parks. This book explores her origins and years of development from a sweet little spark of light with a Dresden doll’s delicacy to a pom-pom-shoe-wearing, mischievous blonde top-knotted fairy. 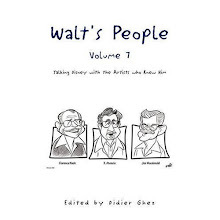 If you have tried to buy Walt's People - Volume 1 since March of this year through Amazon or Barnes and Noble, you may have noticed that this volume is now listed as unavailable. Xlibris seems to have changed its policies regarding distribution and the books they release are now only available for 2 years on the online bookstores. To have the books available there for a longer time, one has to pay a $69 yearly fee. This is a terrible frustration as I was not aware of this policy when I signed up with Xlibris 3 years ago. This additional cost multiplied by the number of volumes in the series is likely to unbalance completely the economics of the project. I will probably have to look for sponsors soon. We will see. For now I have taken steps to get WP - Volume 1 available again asap on the online bookstores. 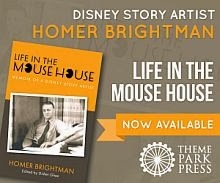 All volumes remain available on Xlibris.com, of course. From the Bob Cowan's collection, here is an old memo about a skiing trip with the "Disneyites". This probably happened in the '30s. I wonder if anyone has more info about this. 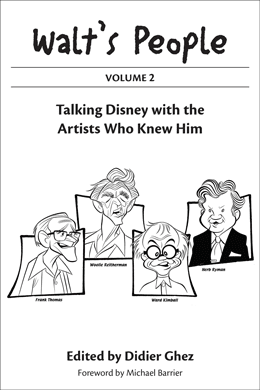 - Thanks to Jeff Pepper for having spotted the great new blog Inside Disney Music. Quite a few excellent entries already. Two nice items by Les Clark from the collection of Bob and Sue DeLucia: The Mickey above was painted by Les for his wife Georgia the year he passed away. 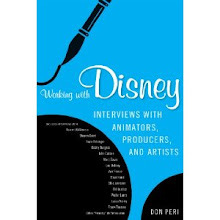 I am clearly looking forward to getting this book when it gets released in August. [There is a very interesting film clip of a volleyball game with the Disney animators versus the Producers on The Blackwing Diaries. John Musker is commentating and Tim Burton, Chris Buck, Darrell van Citters, Randy Cartwright are playing. Nice photo of Dali visiting Walt discovered recently on ebay. Some great photos of Walt being sold on ebay at the moment.